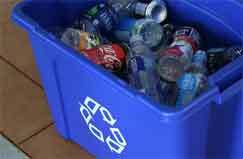 Long the target environmentalists for the waste its products create, Coca-Cola announced last week a plan to recycle as many beverage containers as it produces by 2030– but not necessarily all of its own cans and bottles. The goal is what the company calls the centerpiece an overall sustainability initiative titled "World Without Waste" that was announced by Coca-Cola last week. The goal is to make it so anyone can quickly see which factories are frequent violators, and which brands they're supplying. The other primary thrust of the program besides the recycling goals is what it calls "investments in packaging." Under that element of the initiative, Coke says it will continuing to work toward making all of its packaging 100% recyclable globally, and building better bottles, whether through more recycled content, developing plant-based resins, or reducing the amount of plastic in each container. By 2030, the Coca-Cola system also aims to make bottles with an average of 50% recycled content. It did not provide the current level of recycled content in its packaging. The recycling goal will be achieved in part by bolstering local recycling programs and greater consumer education. Coca-Cola did not to say how much it will invest in the World Without Waste program. "Future growth comes with further responsibilities," Coke CEO James Quincey told reporters last week. "As a company, we must grow with conscience." Environmental group Greenpeace, however, was not impressed with the news. "The plan failed to include any reduction of the company's rapidly increasing use of single-use plastic bottles globally, which now stands at well over 110 billion annually," Greenpeace said in a statement issued after Coke's announcement. Coke along with our large beverage companies such as Pepsico and Nestle have long been targets of environmental group criticism relative to the packaging waste they create. Coke CEO Quincey responded to the Greenpeace barbs by saying that "If we recollect all the bottles, there is no such thing as a single-use bottle. Every bottle comes back and every bottle has another life." However, to be clear, Coke says it may not recycle all of the cans and bottles it produces, but rather an amount of packages equal to the number of containers it produces annually. That, some say, will make meeting the goal much easier. Coke said the largest challenges will be in developing countries and the 25% of countries that don't have any form of formal waste collection. "That's clearly going to be a lot of groundwork with a lot of other organizations and the governments to start building that infrastructure," Quincey said. Pepsico previously announced a goal for having 100% of its packaging be recyclable or recoverable by 2025, while Nestlé aims to reduce its packaging material by 140,000 tons between 2015 and 2020. The issues are more complex than most may realize. For example, adding plant-based material to the plastic packaging can make the bottles not recyclable combination with 100% PET containers. Do you think this tool will be useful? Let us know your thoughts at the Feedback button below.